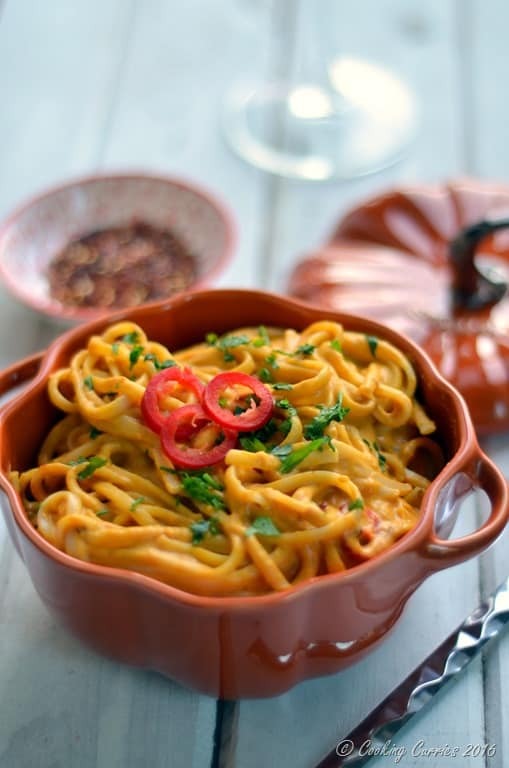 Creamy Pumpkin Linguine with a spicy kick to it from some red jalapenos and red chilli flakes, will take your fall dinner to a whole new level! 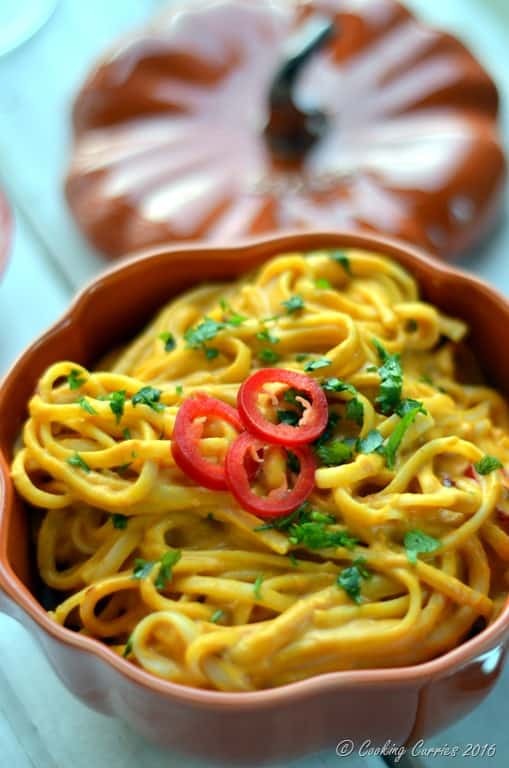 Are you in the savory or sweet camp when it comes to pumpkin dishes? I think I prefer the savory ones more. Maybe more so because that is what I have grown up eating. The Pumpkin Erissery or Kootu was a staple at our house, growing up and it is only after moving here to the US that I even ate something sweet with pumpkin. My first pumpkin pie. It was ok. I think I would have liked that first bite a lot more if I did not go into it with all sorts of apprehension of eating a pumpkin dessert. And it took me a really really long time to wrap my head around the pumpkin pie spice mix and all the various things it found its way into. I really stayed away from that one for a long long time and just stuck to cinnamon sugar, which seemed to work well for me while still giving out a warm fall vibe. I think some of these tastes and flavors need some adjusting to and once you do, you are all in. I love pumpkin pies now and I really don’t mind pumpkin pie spice at all, but in moderation. But if you ask me whether I have moved over to the sweet pumpkin camp, no, I haven’t. I still am very much with the savory side. 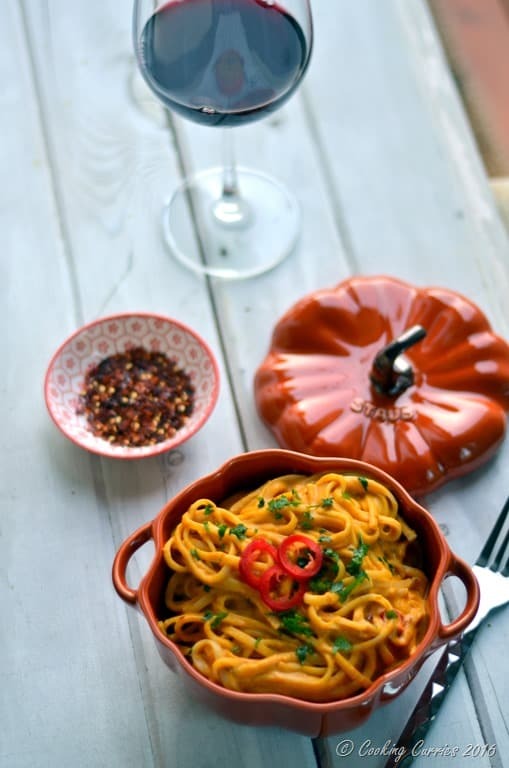 That is how this deliciously creamy pumpkin linguine with a little spicy kick to it, came into our dinner menu one day. 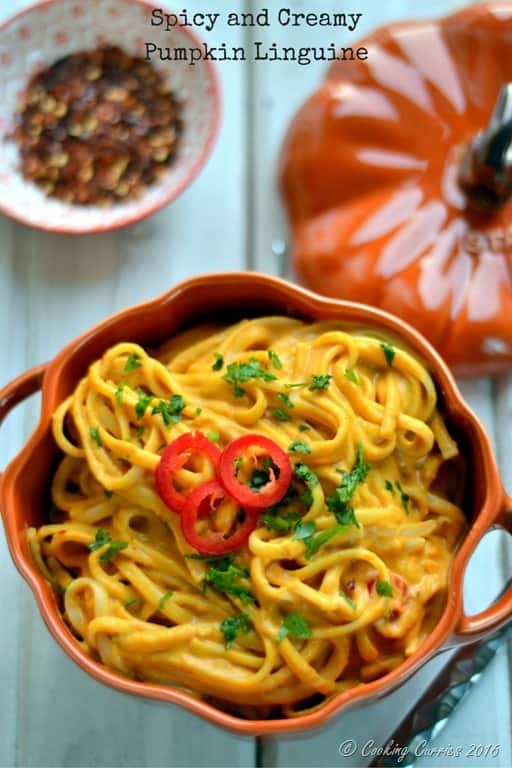 I wanted to make a pumpkin pasta, preferably a creamy one but I really did not want that pumpkin flavor to stick out with just the pumpkin pie spice helping it. I wanted something more. Something that could elevate the pumpkin flavor. I really took a gamble when I tried this recipe and I have to say we all loved it so very much and were very thankful to have some leftovers for lunch the next day. It tasted a whole lot better the next day. Disclaimer: The links given below are affiliate links from Amazon, which means I receive a small commission if you click on them and buy something, but at no extra cost to you. This helps keep the blog going. Always remember that I only recommend products that I have personally used and love! Cook the linguine as per package instructions. Drain and keep aside. Meanwhile, heat the oil in a wide bottomed pan over medium high heat. Add the garlic, once it starts to crisp up a little on the sides, add the pumpkin puree, red chilli flakes, nutmeg, cloves and jalapenos and let it all cook together for a couple of minutes. Add salt to this as well. Now add the heavy cream and mix it in very well. Stir in the pasta and make sure the pasta is coated well with the sauce. Garnish with jalapeno rounds and parsley. Serve immediately. 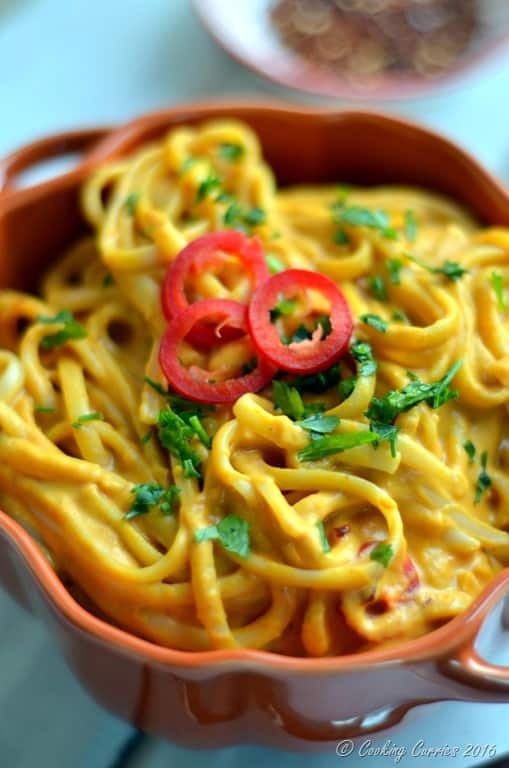 Wine Pairing: This pasta is spicy and creamy, so a medium bodied red with some fruit aromas will help bring out the flavors better and balance out the creaminess while not being overpowered by the spiciness. We had a bottle of La Riviera Malbec, 2015 and it was awesome!